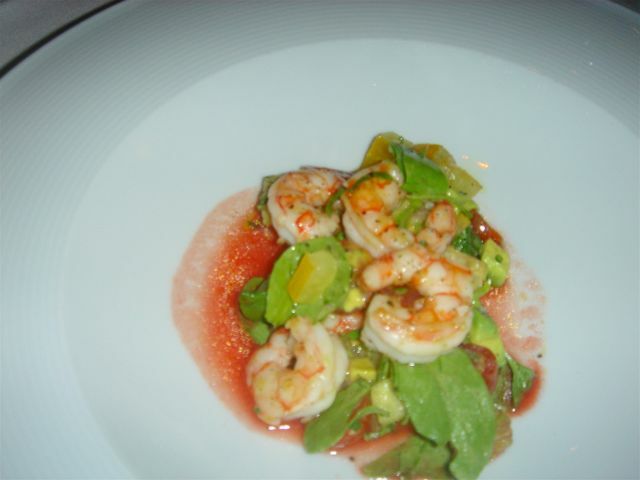 After extensive tasting menus at Manresa and French laundry, we wanted a simpler a la carte experience and Richard Reddington’s restaurant fit the bill. 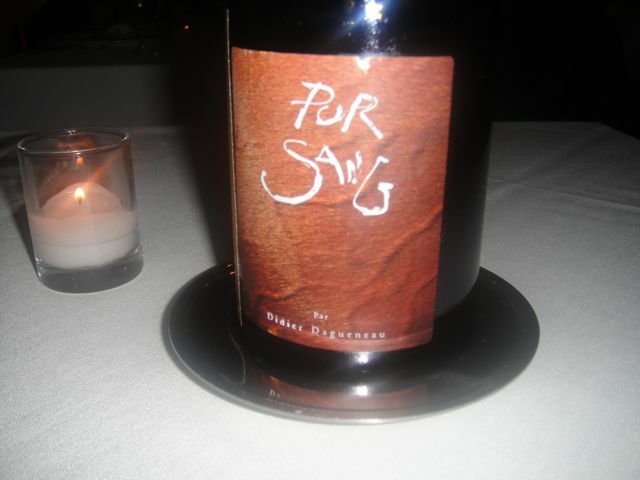 However, we were dining with Gregory Castells who is Wine Director at Soutirage so all bets were off as to wine! 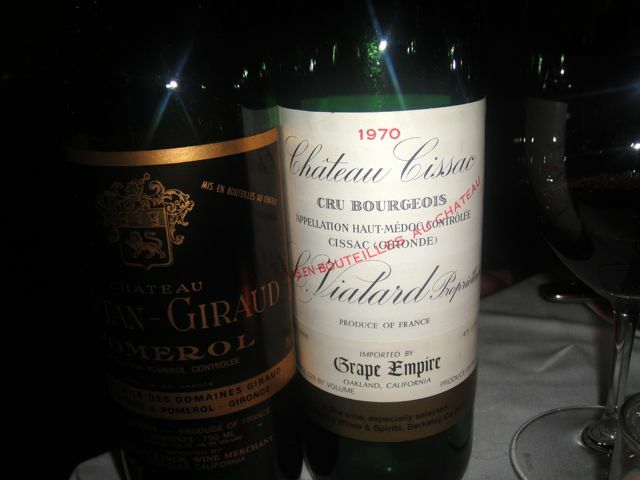 Gregory’s resume is unbelievably impressive – just to name a bit of his history he was head sommelier at French Laundry, Bastide and Petrus London and has one of the best wine palates that I know. We decided to order a la carte. 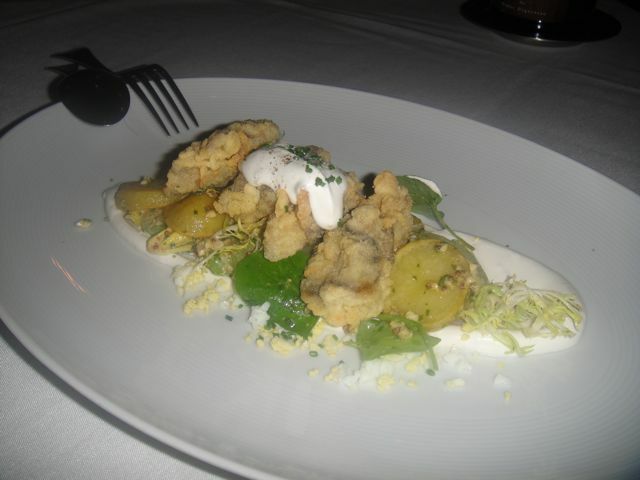 Cornmeal fried oysters, fingerling potatoes, celery, horseradish creme fraiche – I could have been at one of my favorite restaurants in New Orleans – Casamentos eating their famous oyster loaf minus the bread. 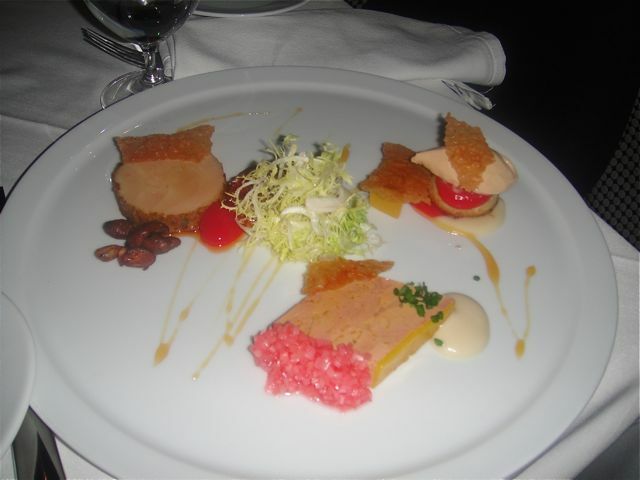 Tasting of cold foie preparations, rhubarb, pistachios – delicious! 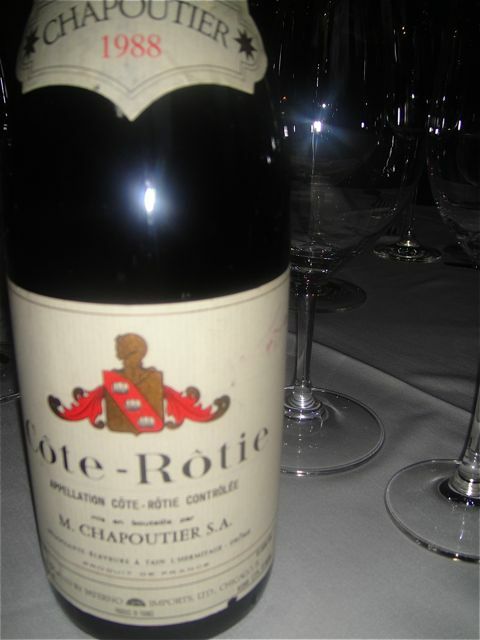 A wonderful evening with great company, delicious food and great wine. 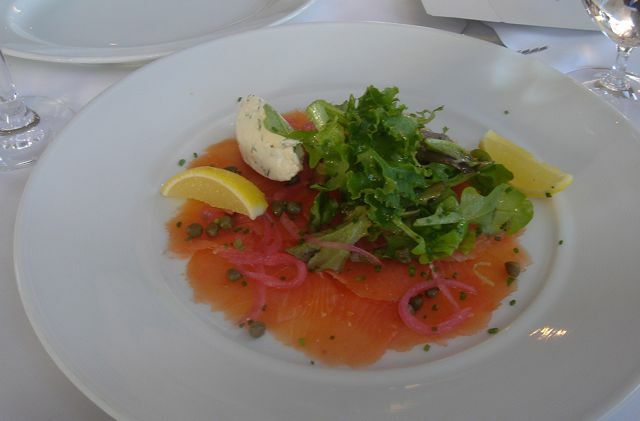 Redd is one of our favorite places for lunch in Yountville. It is an easy walk from our hotel and we try to order “light” before a French Laundry meal – sometimes we are not very successful. We do order splits – one for two. Richard Reddington’s cuisine has many Asian influences – as a personal preference, I happen to really like that aspect of his cuisine. The room is simple and modern with clean lines. Yellowfin tuna and hamachi tartare, avocado, chili oil, fried (crispy) rice – actually the rice is made the usual way and then quickly deep-fried to achieve “puffed” rice – another winner and even though the hamachi ingredient is repeated, the taste is completely different from the previous dish. A gift from the Richard Reddington, the chef. 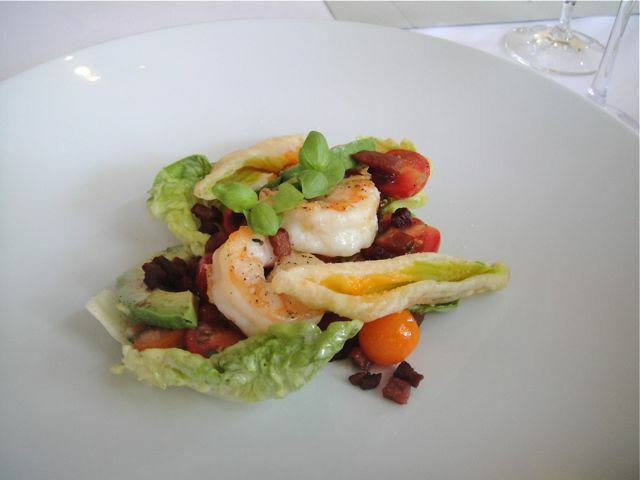 Shrimp salad, little gem lettuce, heirloom cherry tomatoes, pancetta, avocado, tempura squash blossoms – a light summer salad with perfectly cooked shrimp and summer vegetables from the garden. 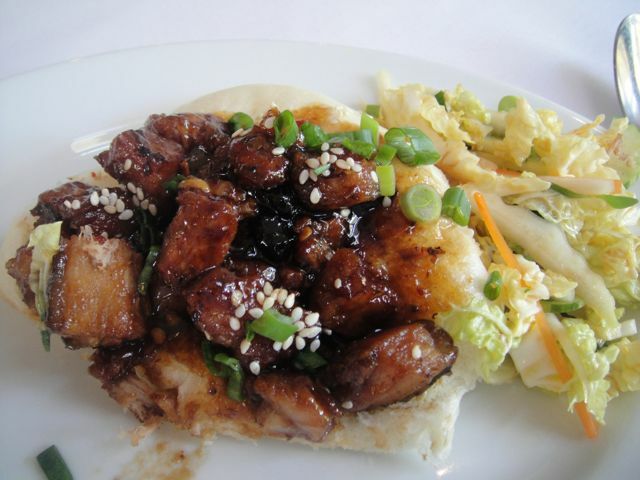 Sauteed pork shoulder, crispy pork belly, hoisin, steamed pork buns, Asian vegetable salad (cabbage, celery, carrots, green onions) – another ode to Asian cuisine that was pork goodness to be wrapped in a steamed bun. 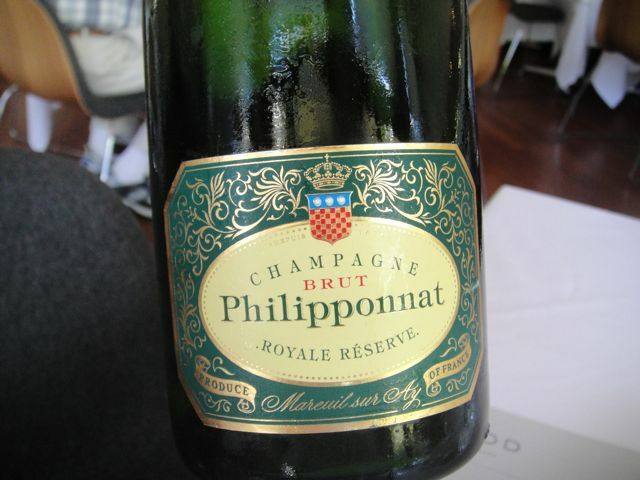 After a very extravagant lunch at Etoile, we decided on a “lighter” 3 course dinner at Redd. 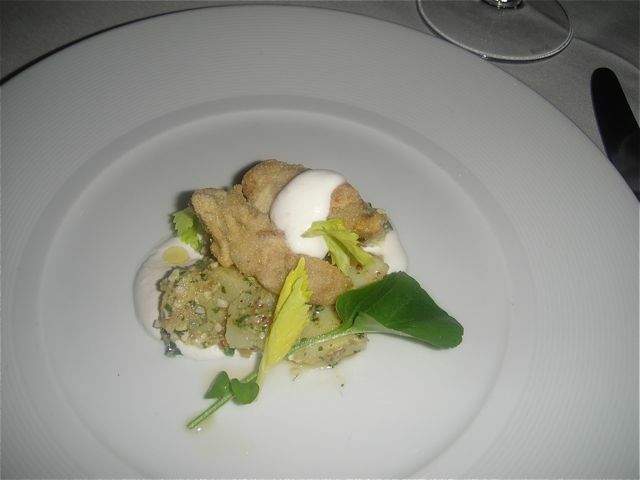 Fried Tomales Bay oysters, fingerling potato salad, frissee, hard boiled egg dressing – the oysters were cornmeal encrusted and were in a word fantastic – I felt as if I was in New Orleans. Tasting of foie gras preparations – seared foie gras, Fuyu persimmon, house-made English muffin, cold foie gras mousse with pear compote and puff pastry, cold foie gras torchon encrusted with huckleberries and pistachio served with brioche, foie gras terrine, frisee salad – another favorite. 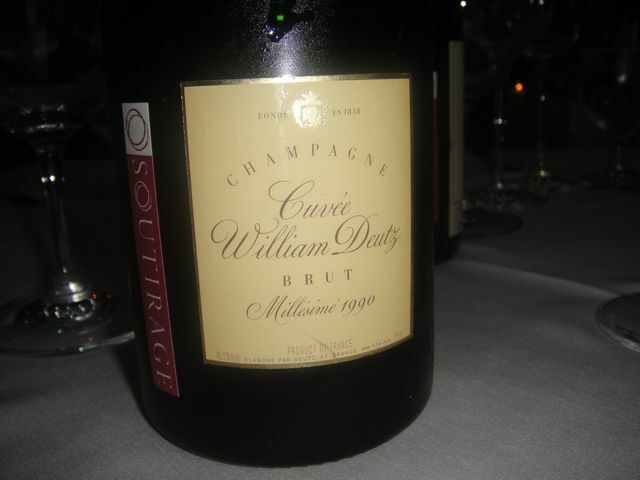 This was served with a glass of Coassart Gordon 15 year old Bual Madeira – perfect. 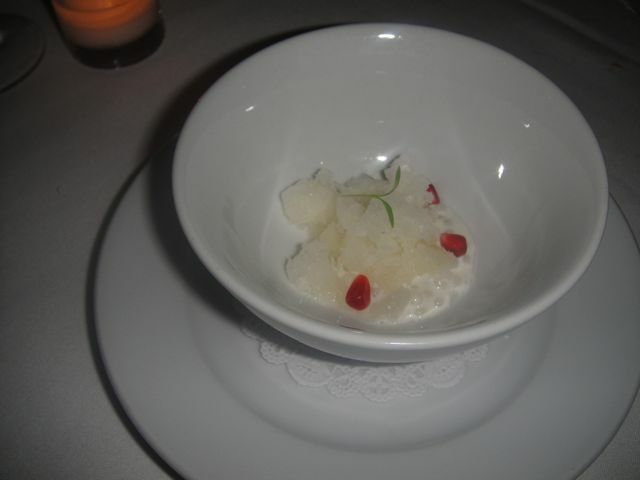 Palate cleanser of pearl tapioca, pomegranate, yuzu granite – a present from Karen, our excellent server. 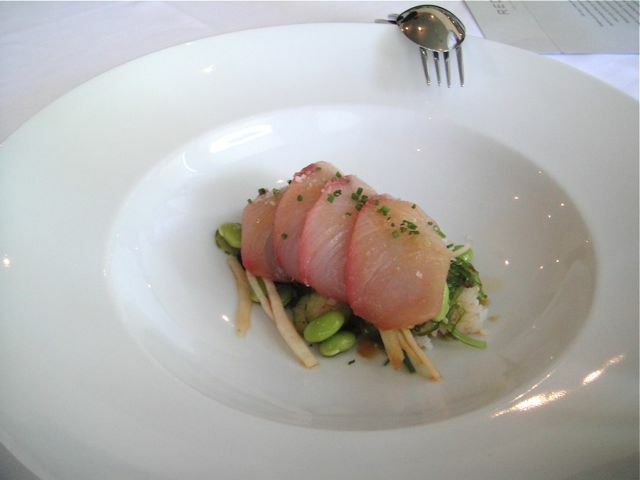 A perfect day of food – 3 courses at Etoile and 3 courses at Redd – what more can one ask for? We have had hit and miss experiences at Redd with the biggest miss being at brunch. 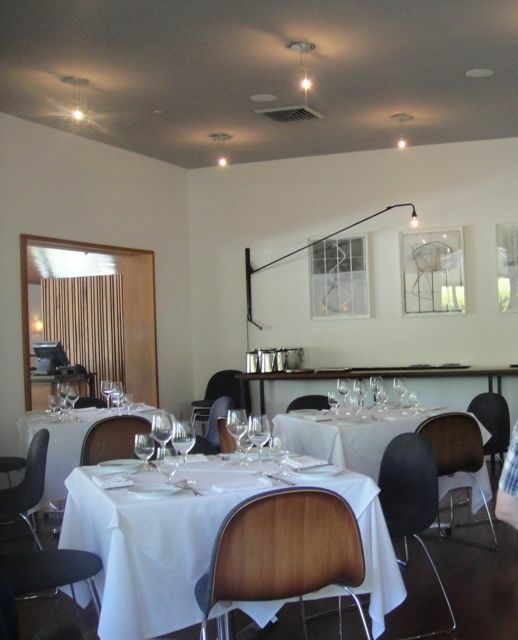 But it is a perfect spot for lunch, particularly before a French laundry dinner. Yellowfin tuna and hamachi tartare, avocado, puffed Jasmine rice, Jasmine Asian pear, chili oil, whole grain mustard vinaigrette, micro cilantro – even though this is a duplication of an ingredient – the hamachi, it is a completely different flavor profile. 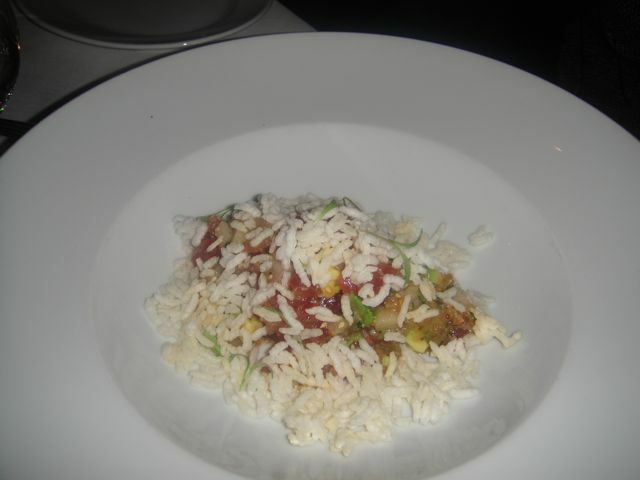 Another excellent course and the crunch from the rice a wonderful textural contrast. Chilled Corn soup with basil oil – Our server was excellent. I had added this as a last moment thought and expected it before the salad. 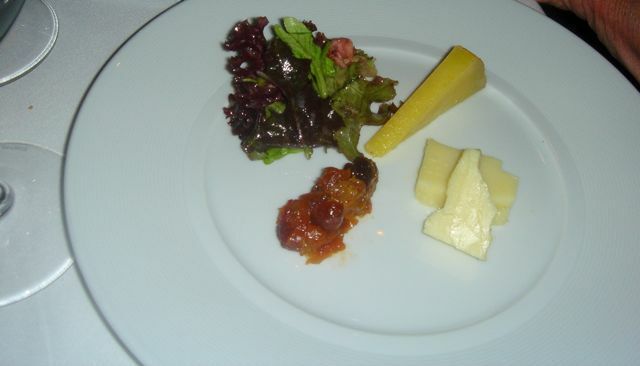 He decided to serve it after the salad as he said it was very rich. This is a 1/4 portion. In any case, it was like eating sweet corn ice cream – a perfect ending to a delightful lunch. Redd is back on track and definitely recommended. Bauer awarded this restaurant 3 ½ stars, but I don’t think the finesse is there to warrant that rating. It is more rustic dining than haute cuisine. Vegetables are handled carelessly; more like what you would find in a bistro or representative of home cooking. Also each vegetable accompaniment had some combination of carrots and onions. 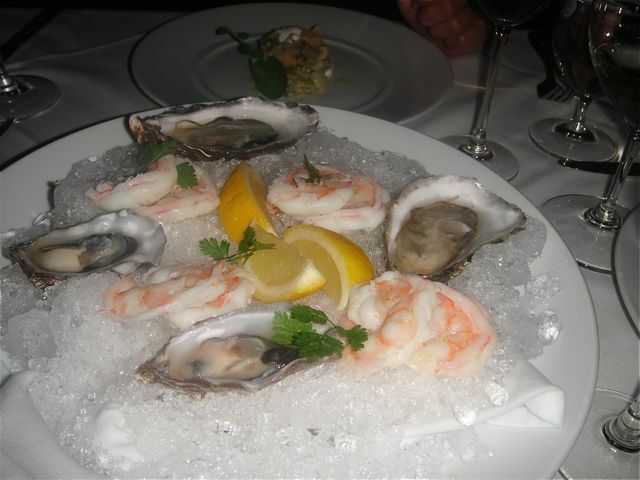 However, if you order carefully at Redd, you can have an excellent meal. 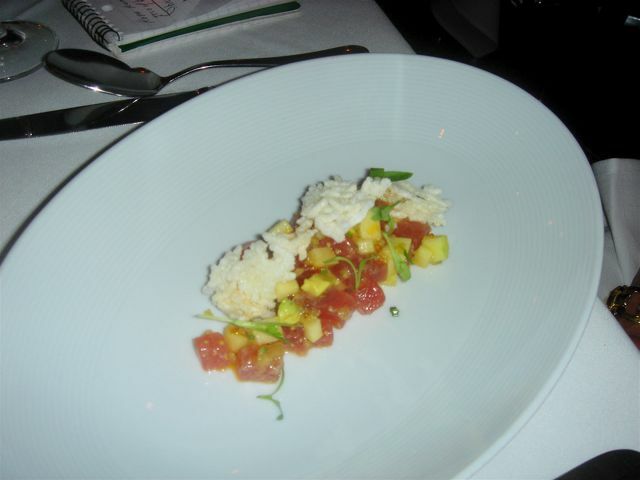 I didn’t feel like the full-out 9 course tasting – this was a five-day marathon of dining so we opted to share 5 courses. 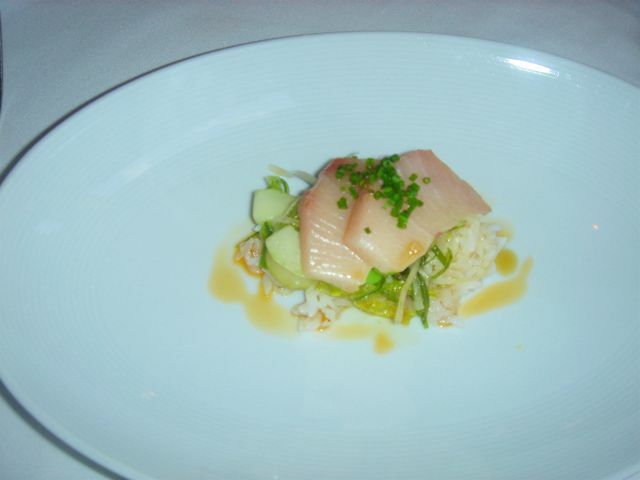 Sashimi of hamachi with edamame, cucumber, sticky rice, lime ginger sauce. This was delicious. The standout was the sticky rice, which had been “battered” and fried so that it was reminiscent of rice crispies. 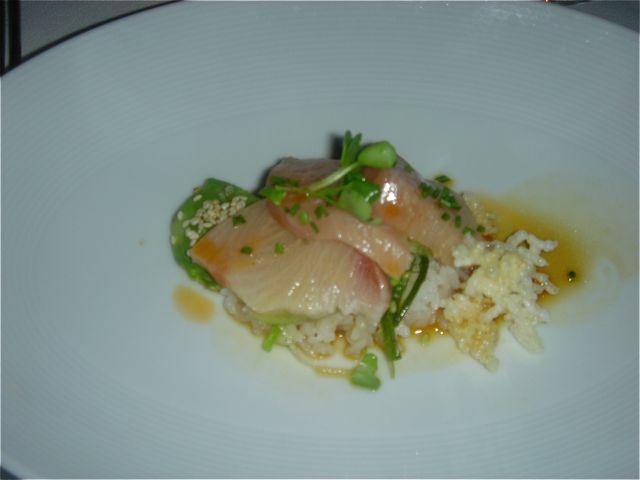 The lime ginger sauce subtle and a wonderful undertone for the hamachi. 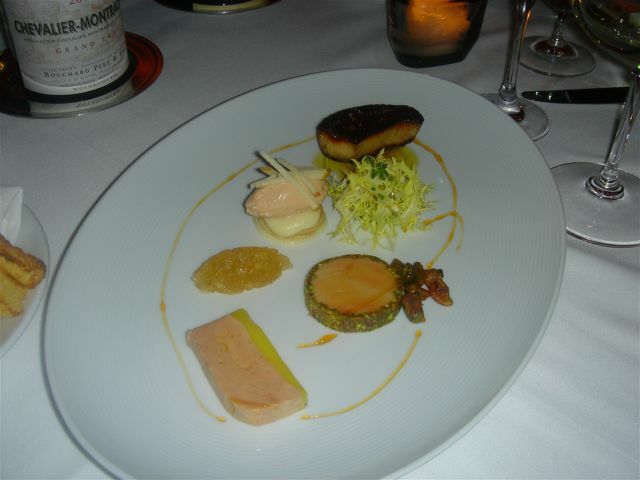 Starting at the bottom right there was a torchon encircled with crushed pistachios, a terrine with apple puree on brioche, apple jelly, foie gras mousse on a blini, seared foie gras and frisee salad. This was an absolute winner. 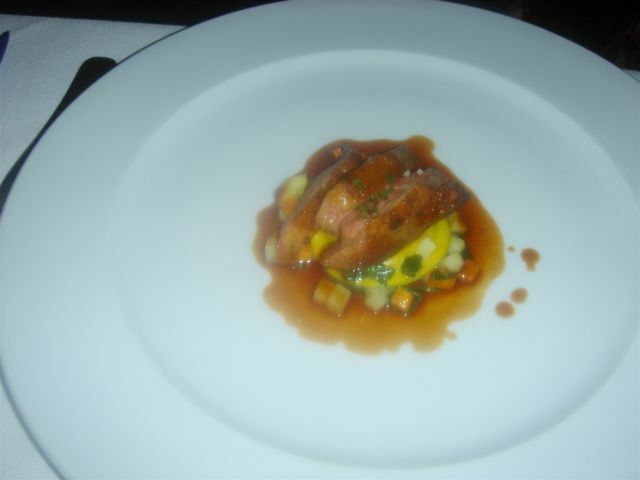 The last time at Redd, we had the squab with the butternut squash ravioli and loved the ravioli part more than the squab. 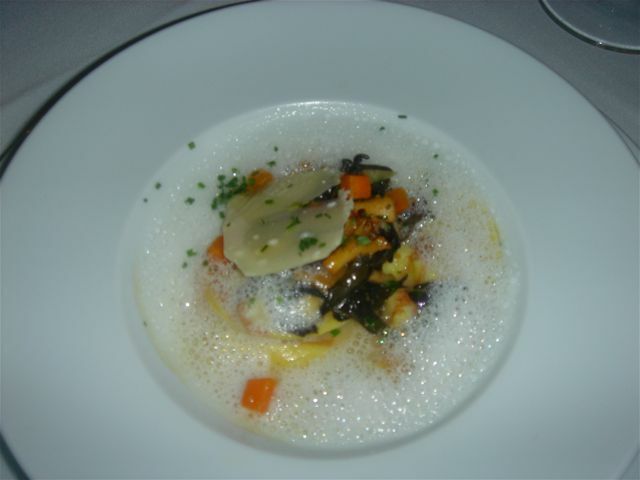 Unfortunately, the ravioli was lost in the ragout of vegetables. The Parmesan emulsion didn’t add much and our waitress said something about a pork glaze that I didn’t detect. This was poor. 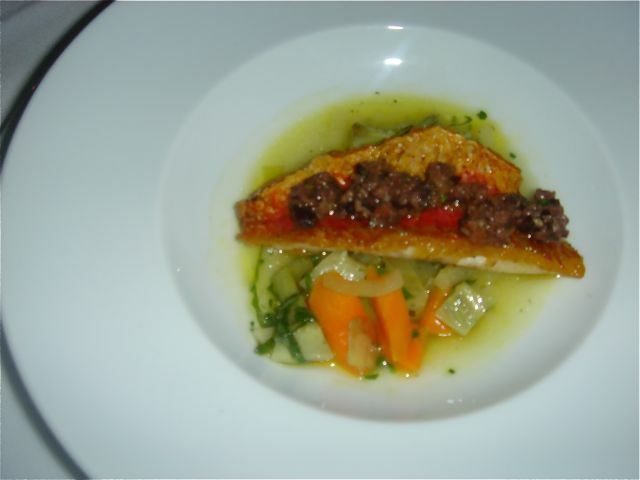 Mediterranean Rouget, pan seared, served barigoule style. 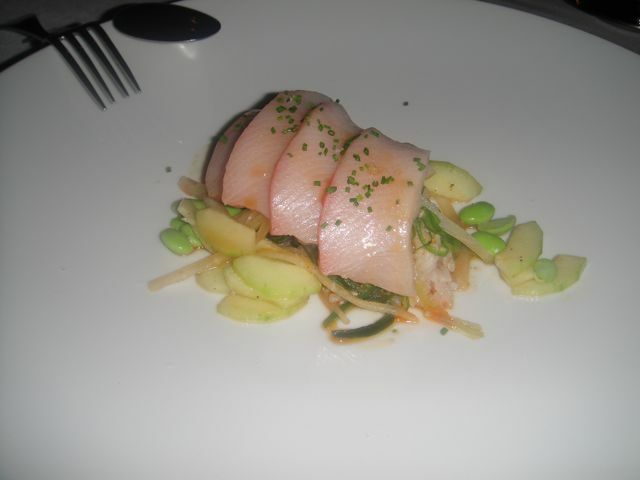 It was served over baby artichokes, fennel and carrots. The broth was a combination of white wine, olive oil and braising liquid – definitely Provencal in taste. 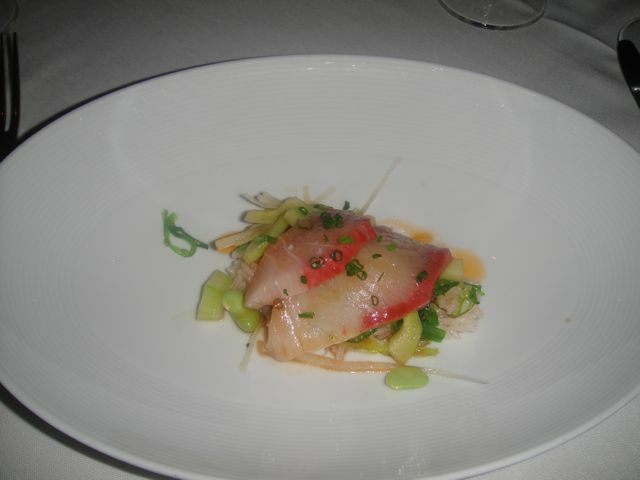 This was the dish of the night – perfectly prepared with perfect balance. 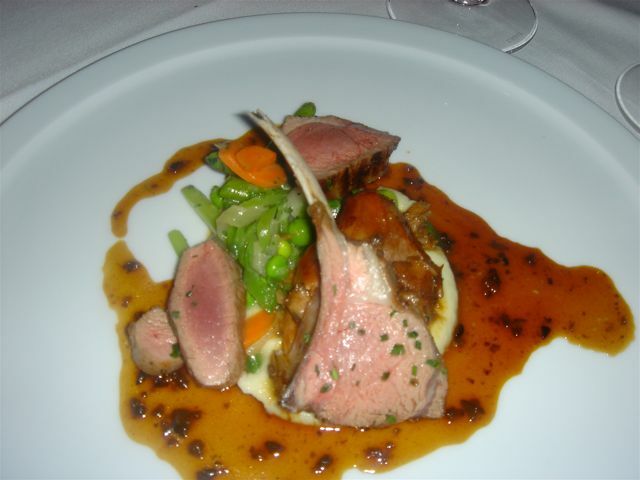 Baby Lamb served with Spring Vegetable Ragout and Potato Puree. 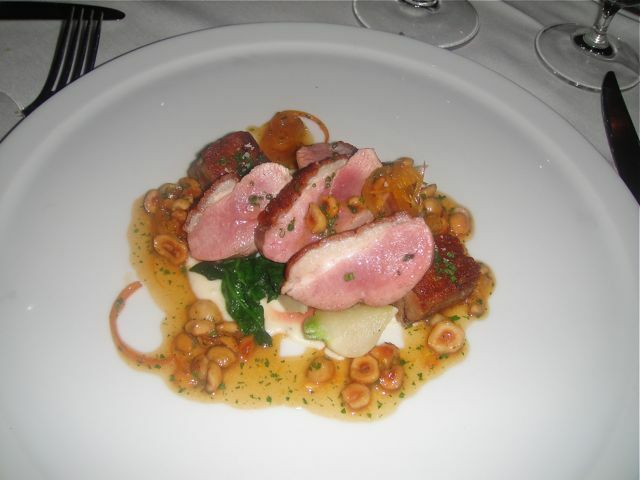 The lamb is from Napa Valley Lamb Co., based in Calistoga, a family farm owned and operated by Don Watson. Watson raises his lambs the old-fashioned way with no antibiotics or formula feed. Also he moves the sheep seasonally between lowland and mountain pastures. The flock’s appetite also serves as a source of income for Napa Valley Lamb Co., which offers environmentally friendly mowing services. For example, the Watsons’ sheep graze in the vineyards of Robert Mondavi, eating the weeds so that the vineyard can grow grapes under organic conditions. Thanks to Wendy, our waitress who supplied us with this information. The lamb was excellent, simply prepared. 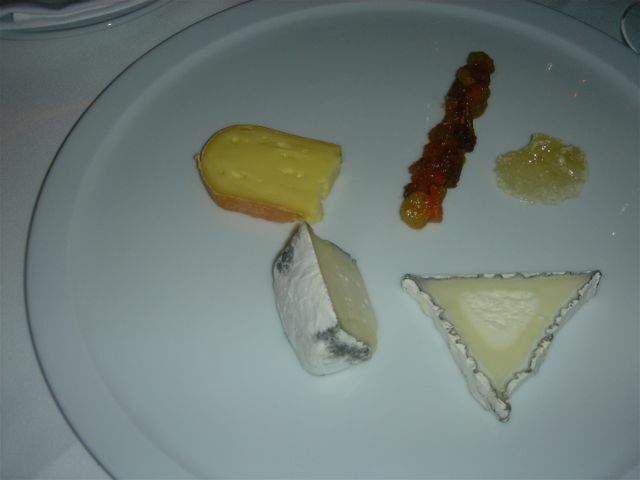 The vegetable accompaniment had none of the finesse of a FL or Manresa. My over-all impression was this was OK, but nothing that couldn’t be produced in any home kitchen other than the sourcing of the meat. A cheese from Cow Girl Creamery – thought she said St Hech’s ?? Over all, this was a good meal, although not extraordinary. Of course Redd was wedged between meals at Manresa and FL and probably suffered in the comparison. I am constantly amazed at how some FOH staff is so good. You would think we lived in the valley and ate at Redd every other week. Obviously, we were greeted warmly had a wonderful table and server. We decided to create our own tasting, with one for two shares. 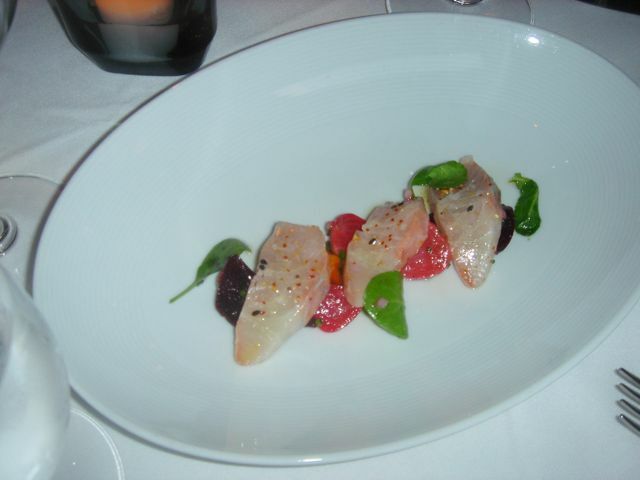 Kona Kampachi with a trio of heirloom beets – purple, yellow and what I referred to as watermelon color. 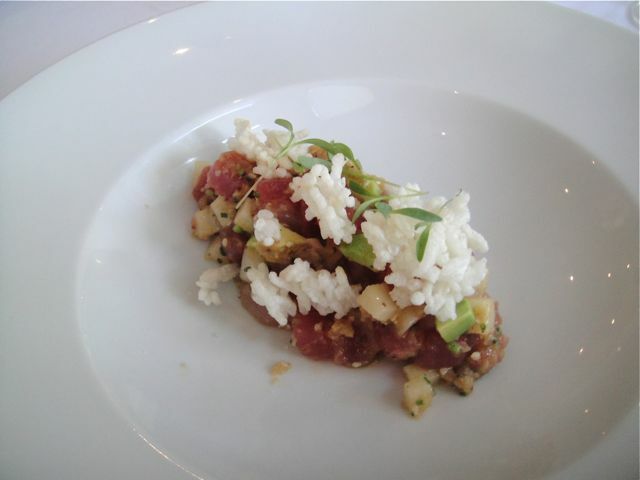 Yellowfin tuna tartare, avocado, chili oil, fried rice, diced apples. The fried rice is a misnomer – actually it is deep-fried sushi rice, closest in mouth feel to rice crispies, without the snap and crackle. 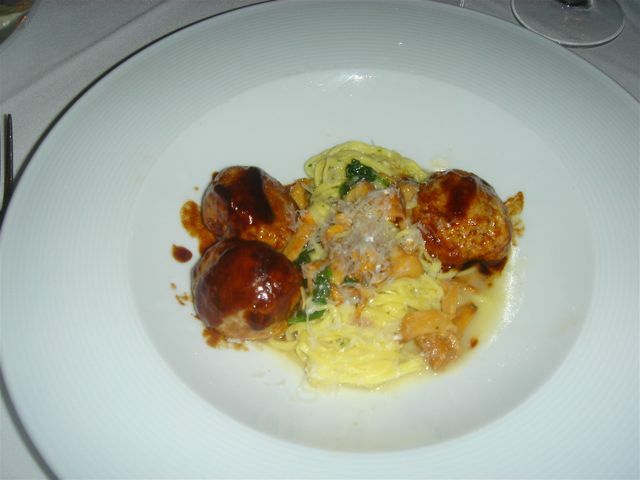 Veal and ricotta meatballs with sage, egg binder, salt and pepper served with fresh linguine, chanterelles, wilted spinach and a sauce of double-reduced chicken stock. The linguine was excellent, but the meatballs had zero taste. 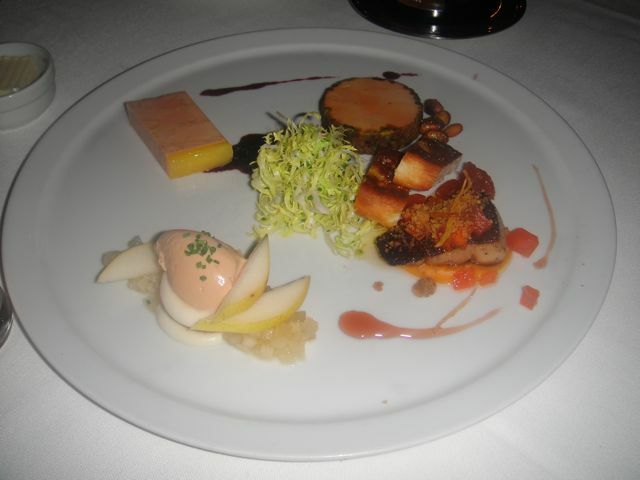 My general feeling about Richard Reddington’s cuisine is that it is far better than what he was doing at Auberge. It is more precise, not as many ingredients on the plate and he is learning restraint. 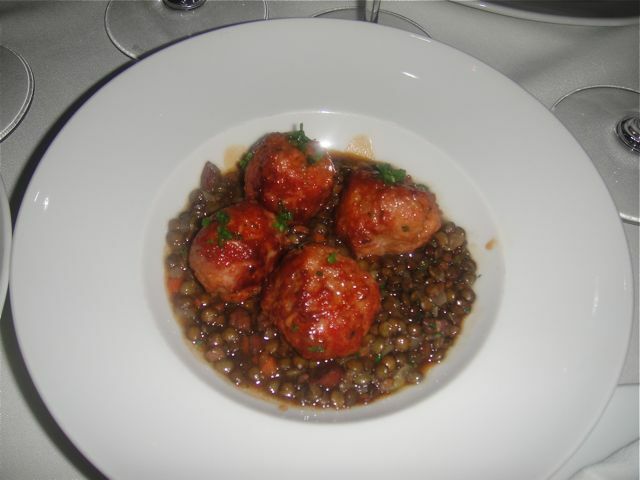 The only loser was the veal meatballs, which was a shame given the excellence of the pasta. 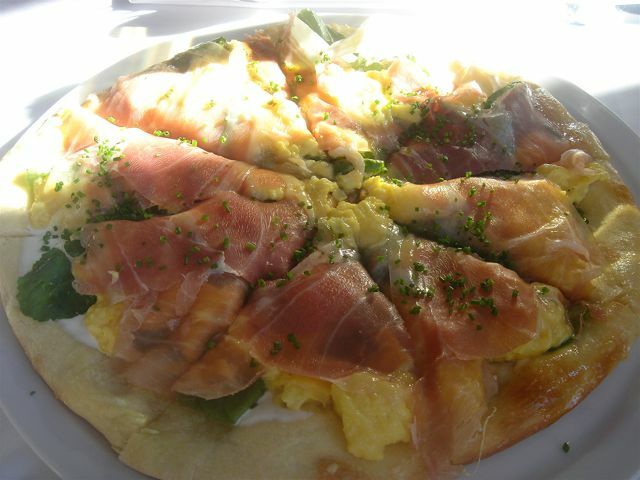 This was delicious, the egg was lightly scrambled, the crust was perfect – an excellent beginning. 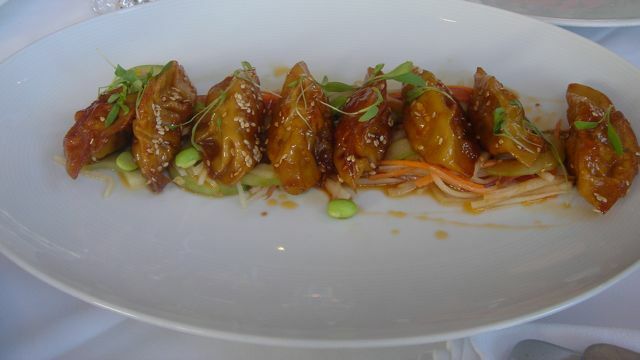 Shrimp and pork potstickers, cucumber salad, chili oil – What an abomination! Whoever made these didn’t mix the filling so as a result each potsticker had a different filling. There were 8 potstickers with 8 different fillings – one contained an overabundance of cilantro, one pork only, one was rubber, one was the Morton salt potsticker as if someone had dumped the entire box of salt in it – anyway you get the idea. 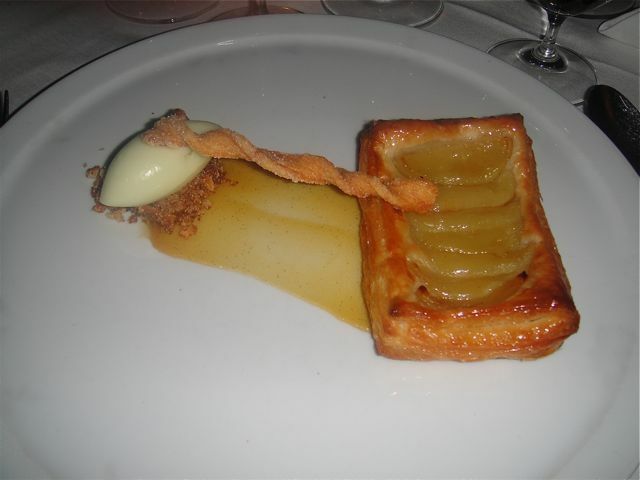 The wrapper didn’t save the dish as it was so pasty, you felt you were eating Elmer’s glue. Needless to say, there was more on the plate than in our stomachs. To add insult to injury, our busser scraped the garbage from the 4 plates to one plate tableside. We felt like we were in a hash house. Smoked Salmon, country bread, dill cream cheese, pickled onions – The quality of the salmon reminded us of packaged salmon a la Cosco or Sam’s Club – again one bite was enough. 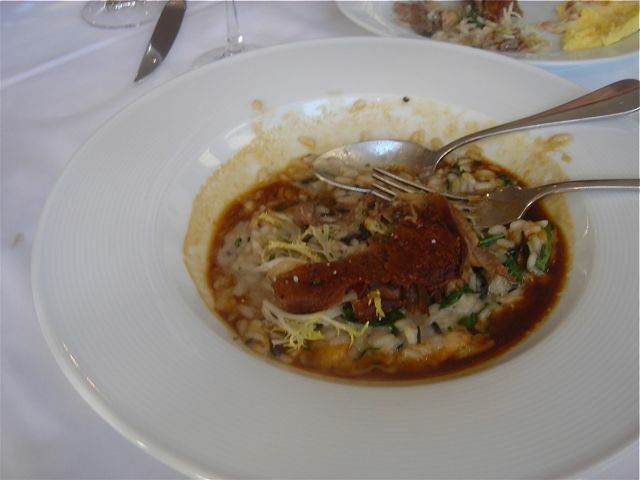 Duck Confit with Wild Mushroom Risotto, Truffle Oil and Spinach – Our friend declared this wasn’t bad. 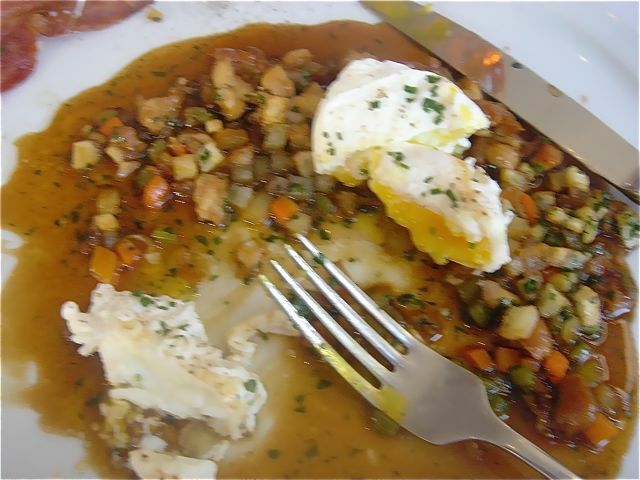 John – Chicken Hash, Jus, Poached Egg, Bacon – John declared that the only decent part of this dish were the poached eggs, The chicken hash was drowned in an awful sauce, the chicken was off tasting and the bacon so salty that it merited one bite. 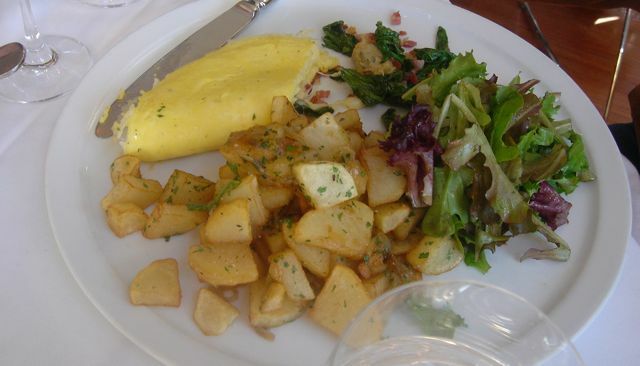 Me – Hangtown Fry Omelet –This was horrible. Think of an omelet made out of yellow rubber balls. To get that texture and taste, I can only think that the cook (notice I said cook, not chef) might have microwaved the eggs. I ate the 3 fried oysters inside the omelet and left the rest on the plate. Everything you see in the photo was what went back to the kitchen! Again, our dutiful busser scraped 2 full platefuls of food onto one plate tableside so she could stack all the plates to take back to the kitchen. 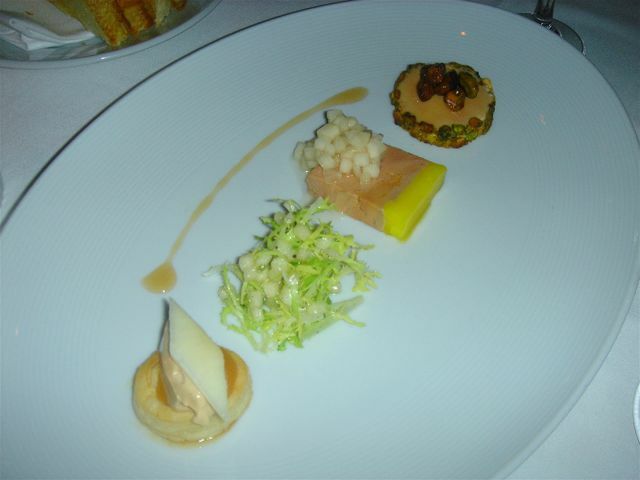 Most of the food from this meal which cost $ 135.77 per couple (that includes 50% of a bottle of rose champagne) went back. Yet, no one even questioned us as to why the food was going back to the kitchen practically untouched. This was a D- meal.